Victory in the presidential election means an introduction to early parliamentary elections, after which, as it is natural, we will get a different government. A government that will launch a new European era of reforms in Macedonia. 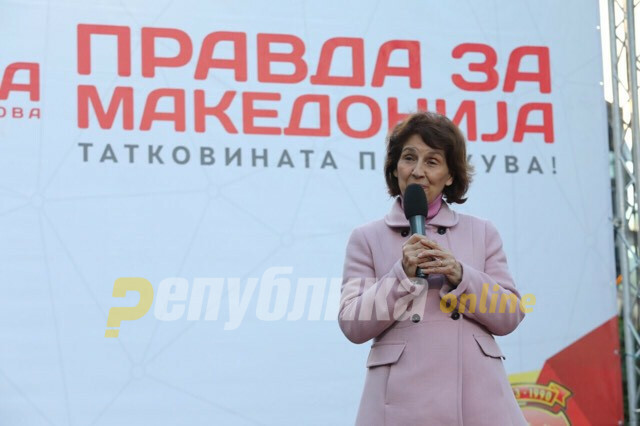 A government which will implement what its program because it will get your mandate for that, VMRO-DPMNE’s presidential candidate Gordana Siljanovska Davkova said Sunday at a rally in Sveti Nikole. A government that will democratize itself and everyone else. This captured democracy, this captured state must be transformed. I think that the time of the transformation comes, she added.